Each year we are invited to cross a very special threshold that takes us from the holy season of Lent to a week of special holy time that we traditionally call Holy Week. This is passing from prayer, fasting, and almsgiving to an entire week of deep immersion into the mystery of the Passion and death of our Lord, Jesus Christ, the unblemished Lamb of God who offers his life for the salvation of all. Holy Week begins with the special Sunday we celebrate today, once called Palm Sunday, but more appropriately known as Passion Sunday. With the solemn reading of the Passion narrative, we encounter Jesus in those last profound days and events of his earthly life. 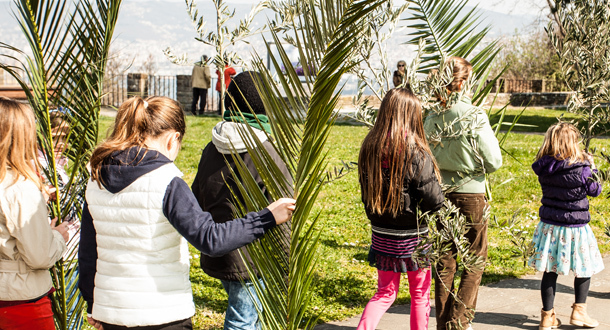 First, we bless the palms and imagine the throngs of people who stand waving their palm branches and shouting hosanna, hosanna to the one who comes in the name of the Lord! We can only imagine the excitement and joy, a thrilling moment that will barely last as long as it takes to ride the donkey through the city gates! And who is the object of these hosannas? Are they cries to the one who gives sight to the blind, and cures the lame, and brings life to those who have died? Do the crowds shout jubilantly for the one who can turn water into wine and multiply loaves of bread and fish into more than enough to feed even thousands? Yet, when the hosannas have died down and the Lord’s own anointed stands before Pilate accused of all kinds of wrongdoing, where are all those jubilant voices? Will they cry out in support and love for the one who will be condemned to death by crucifixion? And where will they be when Jesus carries his cross to certain death on Calvary? So much for the adulation of crowds who love being in the winner’s circle, associated with only the best! Instead, dear friends, our entrance into Holy Week is an entrance into the suffering and death of Jesus himself. And it is during this holy week of special days that we are invited to come to know Jesus in his sacred Passion. St. Paul tells us that Jesus emptied himself in obedience to the Father and that, because of this, every knee must bend at the very mention of his holy name. But if we walk during this week with Jesus we will hear how he is cursed and ridiculed, blasphemed and defiled. Are we willing to stand with him, to carry our crosses as he carried his own? This is a very special time, indeed. How wonderful it would be if you and your spouse, or with your children or grandchildren, could take a little extra time to read the Passion story and to talk together about what it means. Wouldn’t it be wonderful if you could think about Holy Thursday and how Jesus gave us the great gift of himself in the Holy Eucharist, along with the profound example of how we are all called to wash each other’s feet, to care for the poor and the crucified around us? This is truly a Holy Week, a sacred time when one and all are invited to more intimately know Jesus Christ and him Crucified. Fr. Pat Brennan, C.P. is the director of Saint Paul of the Cross Passionist Retreat and Conference Center, Detroit, Michigan. Error: Error validating access token: Session has expired on Monday, 18-Mar-19 14:16:37 PDT. The current time is Thursday, 18-Apr-19 19:37:26 PDT.